This summer, in just 100 days I was able to grow 75% of my food working less than 10 hours a week! I documented every single day of the adventure on my Youtube Channel, Justin Rhodes. 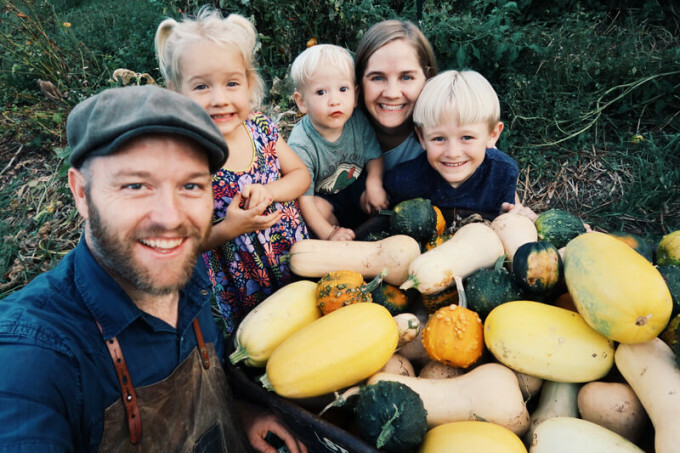 In this article I’m going to give you 10 steps you can take to grow MOST of your own food working less than 10 hours a week–from dreaming big and making plans to saving the harvest for winter. I’ll teach you the stunts I use at every step of the way to make this dream a reality. Write down what you want to grow and prioritize it. I suggest starting with chicken and veggies. Just grow the things you like. Grow things that you’re already buying that are expensive. Now, prioritize each goal by ranking it according to importance. Remember, it’s easier to make a mistake on paper than in real life. Move chickens onto your future garden area. You could place this over a garden area and leave them in it. Or, you could place this inside a pastured poultry net and use it as a coop. Remember, one chicken can till 50 square feet of sod in 4-6 weeks, so make sure you have enough chickens for your garden area or make the area smaller. A greenhouse is critical to the system. With it, you can easily grow plants WHILE your chickens prepare the garden area. So good, it’s almost magic. Use scrap lumber and build it into a sizeable A-frame. Use scrap windows or plastic for the greenhouse walls. Try to time this right. It takes about four weeks for the plants to grow, so think about when your chickens will be ready to move on and start your plants four weeks before. I like to use soil blocks for starting seeds. Plant your plants from the greenhouse. Give it some “insurance” if you have some vermicompost or similar. Water with diluted urine for an extra boost. YES, I said water with urine. Here, David the Good explains what’s up with that. Spray with Basic H to prevent bug attacks. Sheet mulch with cardboard if lots of weeds are present. Look at your meals differently. Where can you use homegrown food? Every time you use food from your own land, you make a difference. Need some ideas? Take an item and ask Mr. Google about it. Those are the 10 simple steps. All of this should take you less than 10 hours of labor per week. Having the chickens till a future garden area while the plants grow. This is a HUGE time saver. Also, transplanting the crops while they’re bigger will eliminate most of the need for weeding. Mulching to cut down on weeds. Learning to eat what’s on the land is key to the amount you consume. Store food for later and rest in the future. I’ve created a special video showing the processes of this entire article. It will be available for FREE inside of Marjoy Wildcraft’s Fall Summit, October 31st, 2016. Sign up for the FREE Homesteading Summit, HERE.